We skipped the hotkeys support in the early betas for Synergy 2, partly because we wanted to get to MVP quicker, but also to see how people would react. So far we've had a few people asking us to reintroduce hotkeys, but they never say exactly why. We don't use the hotkey feature at Symless, and we don't get much feedback about it in Synergy 1... so why do people want it back so much? Please share your use cases for the hotkeys feature in Synergy 1. Never knew there were hotkeys! LOL What did they do? Lock cursor to current screen when gaming. I would LOVE to add "snap cursor to PC X and THEN lock" but i could never get that to work. Being able to send commands to computer A when on B or vice versa for certain AHK scripts is useful things like pausing playback on client computers without interrupting what I'm doing on the server can be useful, one button mute all systems those sorts of things. With the F12 'make this the server' feature, I could move keyboard and mouse control between one or two systems as needed, which is great for me as my desk is hardly ever the same week-to-week. I also frequently have guest systems on my desk and only want to use synergy on it for a day or two, so assigning a hotkey to those is helpful. I have found that it is not possible to use machine locking keyboard shortcuts via Synergy. So things like Windows+L or Control+Shift+Eject do not work. It would be nice to have a hotkey to lock all connected machines. This could perhaps be an additional option linked with synchronised screensavers. 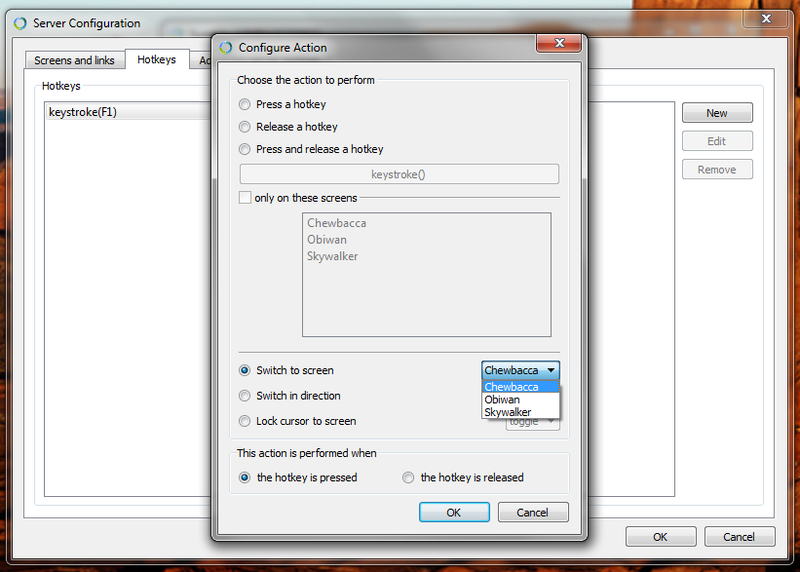 Hotkeys in Synergy allow you to assign keys to specific Synergy actions, such as switching a screen. Love the Screen names. I have setup my VMware and physical labs the same way. For the HotKey Feature, I would love to see more functionality with it. For instance, I use a lot of AHK scripts on my stuff and would like to narrow it down to one solution down the road. No big deal though, I am only one user I can also live with out it. Interesting... what if you could assign a keystroke to run a script or a program? @Nick Bolton Not sure if this is the right place to ask this - probably not, in that case please point me into the right direction! - but I would _love_ to be able to enable/disable Synergy on demand. The reason of this is that I like to switch it off whenever I'm not using it to avoid waste precious CPU resources every time an input is registered on the server. I want to use hotkeys but in version 1.8 for some reason, I was unable to do it. I was using Windows + Linux. I use Hotkeys a LOT because I have a CAD Workstation and an Surface Laptop with an external Screen and basicly the hole Keyboard ist remapped for the CAD mashine. For me this is the most importend etxtra feature of Synergy. The only one that woud be of simmuar importence woud be rubust file Drag and Drop but that nerver worked for me so far -and to be onnest working of an NAS with Ram-DiskCahing is better for me IMO. The only hotkey I really need is CTRL to allow screen change. Like this: Lock cursor by default, unlock while CTRL is pressed, and lock again when released. That way I can still use what was once called the aero-snap feature of Windows and also auto-hide the taskbar. Just because it's a standard feature of most otherKVM-switch software. As long a I can freely bind a key (or multiple at the same time, as mentioned) to this function I don't really care. Exactly this, might cause some glitches if you don't have the mouse staying within the middle screen or which ever screen you're gaming on. So using a hotkey to allow mouse to cross boarder prevented this in previous version. Also helpful when streaming with 2 PC setup. Honestly I only use the hotkeys because sometimes my Windows Server gets its mouse stuck on it's Linux client and so I can get the mouse back to, for example, log in to my locked Windows session I have to use the hotkey.